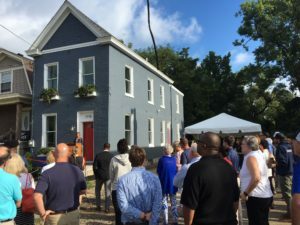 A ribbon cutting ceremony in Evanston celebrated a years-long journey of restoration for both a home and dozens of young adults. The house has been the cornerstone of the YouthBuild program, part of Easterseals serving Greater Cincinnati. SSRG was brought in to install tiebacks throughout the YouthBuild house. The team enjoyed seeing the completed project at the August 21 ceremony. The YouthBuild program offers at-risk youth an opportunity to complete school while learning a trade. They learn construction skills on-the-job as they renovate a local property. The property is then offered back to the community as affordable housing. Easterseals acquired the Evanston property through the Greater Cincinnati Redevelopment Authority after it had been vacant for some time. The years left vacant had taken its toll on the structure. 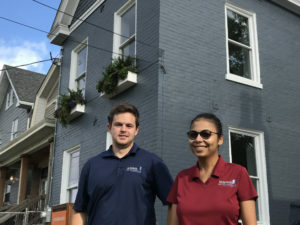 After several months at work encountering challenges with the foundation and more, the YouthBuild staff sought expertise in reinforcing the aging home. They turned to SSRG. Led by William Littlejohn, the SSRG team installed tiebacks on all four walls of the home. Put simply, tiebacks are steel rods that reinforce the connection between the masonry and the interior framing and joists. The process stabilizes a structure and prevents bowing. SSRG was proud to provide their expertise to this important project that builds community and future members of the construction industry. SSRG team: Project Manager William Littlejohn and Project Engineer Sakshi Sharma. 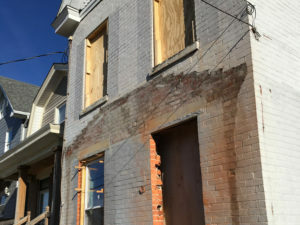 The home before its transformation, and lacking tiebacks.